I took an unscheduled rest day on Friday and hoped to make up some miles today. The weekend weather was supposed to be hot and humid, so I planned to get out early before temperatures got into the 80's. Unfortunately, I didn't get to Bethpage State Park until 8:00 AM, and the heat was already rising. Prior to my run, I tried the last of the "test gels" that I'd recently purchased at REI. 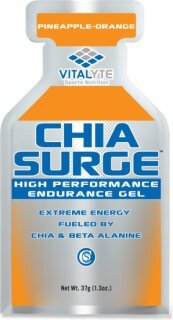 This brand was called Chia Surge and, according to its website (VITALYTE), "Chia Surge is the first gel to combine Whole Seed Chia and Palatinose for mile after mile energy and muscle fuel, with Beta Alanine and BCAA’s to buffer lactic acid and improve muscle performance." That sounded pretty impressive and I had high hopes that it would help me through my planned 6.2 mile run this morning. The gel contains Chia, a seed that is featured as a natural source of energy in Christopher McDougall's book, "Born to Run." I had experimented with Chia seed after I'd read the book and found the energizing claims inconclusive. If you think you'd be squeamish about putting a thick, sweet, but slightly chemical-tasting syrup in your mouth, you may want to avoid this product. That's because it gets worse when you feel the grittiness of hundreds of Chia seeds that crunch as you (involuntarily) chew them. I followed my ingestion of Chia Surge with a rigorous flossing session. Still, I'd hoped that the gel would provide that promised surge that would get me through the heat and my challenging route along Bethpage's rolling bike trail. I began my run at the trail head and took note of my energy level. I felt a little below average, with heavy legs and low energy. There was no surging going on, at least at that point. A look at my splits showed some interesting metrics. I'd covered mile one in 10:30 which, even for me, is slow. But something weird happened after that and my pace dropped to the low 9:00's for the next couple of miles. Was it a delayed reaction to the gel? Or did that easy first mile warm me up for the next two? If it was the former, I'd say that Chia Surge provides a little extra energy for a short time. By mile four, the heat was getting to me and the running became more difficult. I'd filled my gel flask with water and used it strategically because it only held 4 ounces. I like that it fits nicely in the pocket of my Brooks running shorts. The route is out-and-back and I'd wished I turned around sooner at that point, but it was too late. I had to do my full six. I struggled through the rest of the run and dreaded the last hill that took what was left of my energy. I definitely slowed down after mile three, but considering the heat and my low energy start, my overall pace wasn't terrible (10:17). I certainly felt like I got a good workout. I can't say that Chia Surge helped or that it didn't. I was more impressed with the experience I had with both the Accell and the Chocolate #9 gels last week. It would be unfair to judge a product based on a single use, but it's unlikely that I'd try Chia Surge again. There are too many other options out there, and none of them require dental floss. I'm not a "runner", I do run several times a week at a steady, but slow, pace. As a result of an accident I have a lot of metal in my legs; considerable muscle loss and skeletal damage. That, compounded by the fact that I didn't try running until age 62 - 30 years after my accident - renders me about the least qualified to comment. ...but qualifications have never stopped me before. I use Chia Surge on runs lasting over 45 minutes and I can't swear that something else won't work just as we'll - but I have used others without the same success. I use the product about 15 minutes before the run starts and I feel the difference carrying from about 45 minutes through 90 minutes. I would cats gorier it more as endurance than a surge! It is a more fluid gell than many, so I think it goes down easier than many of the other gels. I'm glad to hear that this product works for you. I can't say that I found it ineffective, only that I didn't like the taste and texture and didn't think it provided as much benefit as other gels that I use. It puzzles me that you start to feel the difference after 45 minutes because that's generally the point when a runner's body would be depleted of glycogen. I didn't get any benefit from it after 45 minutes, though it may have helped some between the 10 and 30 minute mark.